This women's versatile bag can be worn as a backpack or slung over your shoulder as a tote. Well-suited for your daily commute, the top-loading main compartment includes a padded pocket for your laptop. It also has two drop-in pockets plus an outer zip pocket for the small stuff. Rugged and water-repellent, this hybrid pack is designed to shrug off dirt, stains, and light rain. Dimensions: 17" x 14.5" x 3.5"
I purchased one of these for my wife to take on a recent hiking holiday in Japan. Having read other reviews previously I installed a couple of plastic clips to hold the shoulder straps in place. This did the trick, otherwise the existing adjusters won't hold the straps at the correct length. The clips did their job and my wife found this backpack indispensable on day trips. She has now thrown out her old day pack. I like most things about this bag. The quality material, versatility and amount of compartments/pockets are my top three. I do wish there was more thought put into a way to secure the straps when using it as a backpack (which is my main use). Every time I take the bag off the straps slide out of place and have to be readjusted every single time I put it back on. Also the shape of the bag make it a little difficult to to fit anything irregularly shaped in the interior or on the side pockets. In summary, I am not totally dissatisfied but the bag did not live up to my expectations because of these things. I was looking for a back that can be worn multiple ways for a cruise and came across this bag. It is sturdy and durable and fits the bill and the pricepoint! 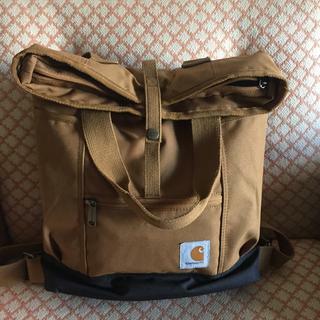 Some other bags I saw were 3x-5x more expensive and not as good of quality as Carhartt stands behind. Straps are adjustable in length to accommodate cross-body, back pack, hand bag, or shoulder bag. I will most likely use it as a backpack or cross-body more often then not. Straps are not remove-able only adjustable so you have to adjust and deal with the straps depending on how you want to carry the bag. This bag is perfect for walking around the city. It can hold all the stuff I normally carry with me. It is also a nice design. I'm a high school teacher, and this rugged bag is awesome! Easily fits my laptop, accessories, and can be worn as a backpack or carry-bag. Perfect! Glad I read the reviews about the straps! I've had the bag for a few days now and I really enjoy using it. The material feels good and I'm not worried about it diminishing over the years. 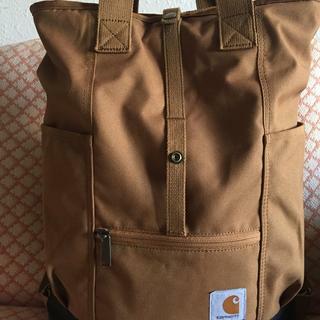 The color is so nice, I need more of this Carhartt Brown. The padded pocket in the back is a nice bonus and I like the strap that it comes with. I'm able to fit my 10.5 iPad pro, a keyboard, a book, my lunch and keys/wallet in the bag with a bit more space to spare. I'm really loving the look of it and the smallness, I have a short torso and always find that my bigger bags push my belt and pants down a bit in the back. I'm glad I read the reviews about the backpack straps though. I can see how they're a bit annoying and I'll hopefully troubleshoot that soon enough. They're not too annoying right now, but I have accidentally pulled on a braid or two of mine while trying to put it on while it awkwardly shifts to one side. For now I'll just try to talk myself out of buying the Black version. My bag collection keeps growing and growing. 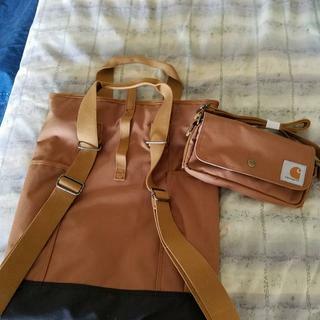 Welcome to the family Carhartt! This bad is very cute, very sturdy. Unless I'm doing something wrong, the straps are a little difficult to manage when you're using it as a backpack, however. But I'm still figuring this thing out. It's smaller than I anticipated but it also forced me to stop carrying so much unnecessary junk. I think this item will last me forever. Please contact us at 1 800 833 3118 if we can assist in any way. This backpack offers many carrying options. It's slim so it doesn't hold too much but enough for my casual use. I don't care for bulky packs so this is perfect for me. 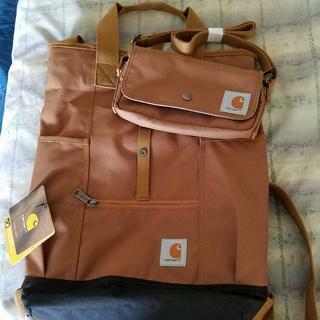 I love the Carhartt brown! I love everything about this bag...except for the fact there is nothing to keep the back pack straps in place...so when its on my back and I go to take it off the strap gets as long as it can. I'm always adjusting the straps. I still use it everyday and it can fit my laptop and a couple other items in it. I love this bag. It’s the perfect size to fit everything during my last year of college and when I’m not using it for school it’s my go to to use as a purse. It’s sturdy but can be used when I have to be dressed up or down. I also love the act it can be adjusted from two different styles as a purse to a cross body to a backpack. Great, well made product. My daughter asked for this to use for school. She loves the look and that it's made to last for years. Great bag for travel! Love the versatility and can hold all my essentials. True hybrid, one of the best. Very versatile. Perfect for a computer, notebook, 40 oz water bottle and wallet. If using the backpack straps, it can be a bit precarious each time you put it on. Overall, highly recommended. One suggestion- durable, water proof bottom, snap system to secure backpack straps when wanting to only use it as a backpack. Still the best hybrid I saw when searching, well done! I absolutely love this backpack. Enough that I would consider buying it in both colors. I planned to use this for work, considering it had a laptop sleeve and ample storage, but my company issued laptop (read: large and bulky from a Big 3 OEM) makes carrying it like a backpack a little awkward. I may request a smaller laptop, or check for a different backpack. I will definitely use this for travel, day trips to the market, biking, etc though! I use it t carry my work stuff to work and home each day. Has enough pocket for keys and wallet and looks great and is easy to grab with all the different handles. Seriously favorite bag ever. I love it. Perfect as a bus bag or a daily hauler. Just got it, just filled it, can't wait to bring it with me to anyplace. I also bought the small clutch so I throw the cellphone and cash into there. Lots of pockets in the big one, very durable, haven't tried the weather durability yet but most happy with the size and hardiness. Best feature too seems to be backpack straps. Hardy, just like this woman! Selling point here is "Hybrid" you choose how you wear it. In fact, I switch it up throughout the day. You can dress it up or down. Straps and overall material are quality. You even get 2 deeps side pockets for waterbottles or easy access to other things. I knew I made the right purchase when I stopped having to switch bags depending on what I was doing because this bag does it all. Compliments my lifestyle, especially ridding my bike as I am a commuter. I even used this on a recent trip to B.C. Never had to worry. An all elements bag but most of all this is just a really good looking high functional bag. Perfect for plane, perfect for the bike. Very well made. Side pocket for I pad. Going on a bike and barge trip in July. Will be perfect for the trip. Are there plans to make this in blue, green, or gray? Love the style just wanting a different color. BEST ANSWER: Not at this time, but we're glad to share your feedback internally. Is this bag durable enough to carry small hand tools like a hammer, screw driver and bits? How many pounds will it hold? BEST ANSWER: Yes, the bag is big enough to carry a hammer, screw driver and bits, but I wouldn't load it down with much more than that. Although my husband swears I put 10 to 15 lbs. of 'stuff'' in my bag (I carry extra things to work in it)it's probably 8 max but it holds up great! One of the most rugged and durable bags I've had! I hope this helps to answer your question. Yes! It is definitely durable enough to carry some tools. I think the real question is how much weight can your shoulders take? Due to the adjustable strap options, it does not provide as much back support as say a "normal" backpack. But the adjustable straps are one of my favorite features! overall it is a great bag and I'm happy with my purchase. I have used it to carry a large, full Yeti cup, a laptop, overnight bathroom bag and a variety of other strange items and haven’t had a problem with the weight of the load. I have had the bag for a year and don't like to carry more than 5lb in it. It seems durable, but it can be rather awkward to carry as a backpack and one strap is adjustable but does not stay in place. I think it is more suited for a computer bag. This bag is pretty sturdy and will definitely hold your small tools. I usually have up to 10 lbs in my bag and have never felt that it might give out. Is this bag heavy when it's empty? No more so than an average purse. My fiancé loves it because it doubles as a backpack and an over the shoulder bag. Its heavier than typical bag because of the material. Definitely sturdy though. Not heavy because it’s not very large. No, it’s canvas so it’s very light. No. Not at all. I use mine daily. No. It is not heavy when empty. how is there not any pictures of the inside of the bag? reason not to buy. BEST ANSWER: We will pass your feedback along to our web team. How many liters does this bag hold? How tall is this bag when folded and snapped? Would it still fit a 15" laptop? BEST ANSWER: 12”” when folded .and snapped. So, is there anything about this bag that makes it specifically for women? I assume men would be able to use this bag without a problem? can i use this as a work bag/folders a few other things and shoes? BEST ANSWER: Depends... currently I use it for school and can fit my lap top, 2" text book, novel, wallet and coffee mug. It's a tight fit. If your talking a couple of files and some flats, I could see those fitting nicely. You'll really like it for a mid sized cross body bag that would hold a small book, wallet etc. At least that is how I've found it to be most useful. Depending on the size of the shoes, yes. I fit a 12" laptop, notebook, small umbrella, water bottle, small organizer (the size of a pouch makeup bag) and miscellaneous items. It doesn't fold over with all of this in it, but I can still wear it as a backpack. I'm a nurse & carry my bag for work. I love the flexiblity between a backpack or messanger. The pockets help organize all my things, it's lightweight & comfortable to carry. I use it as a work bag and fit my work lap top, few folders, and a few smaller items. I don't know about shoes. I guess it would depend on the type of shoes. Is this made from canvas or leather? BEST ANSWER: This style is made of 100% polyester. 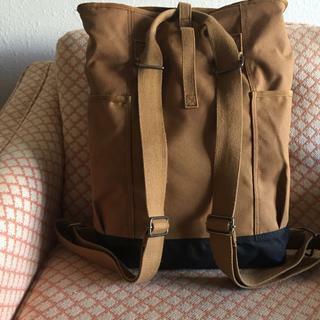 Can this bag still be worn as a backpack comfortably when filled to the top? BEST ANSWER: Yes. When the flap can't flip over to snap, there's a secondary snap towards the top that you can also snap. It still zips shut all the way. I carry a thin, 13" laptop, folder/papers, notebook, and a few small items in this bag for work regularly and can carry as a back-pack. Keep in mind the backpack strap can slide side-to-side, so the only downside was physically putting the backpack on my back takes two hands and holding the straps in place. It fits over bulky winter coats with hoods, too. Yes this is a versatile bag that is completely comfortable jam packed or loaded with a few items. They aren't padded straps, but sturdy and strong and yes can be worn as a backpack when full. Yes - can function as a backpack when filled to the top. BEST ANSWER: No. The front handle is stationary and maybe has 6" from top of the bag to the top of the arch in in the handle. The back handle is adjustable to wear as a backpack or carry like a tote. I tried to test the shoulder usability and it really doesn't work well as a shoulder bag. Yes, this bag could be worn over the shoulder if preferred. I would say there’s about 7”-8” from the top of the bag to the top of your shoulder in that position. it is! i won't hang long but does fit over the shoulder, and will be tucked right under the arm. If you are referring to the top handles, then no, it cannot be put on the shoulder that way. How do I apply extra points to my account, I was given a code by sales person for extra points? And also a receipt for a purchase that points were not added due my profile not yet set up? BEST ANSWER: Please call Customer Service at 1 800 833 3118 so we can look into this matter. Is this big enough for a laptop and a binder or books? Wondering if it would work well for nursing school. Also, how big of water bottle fits in the side pockets? BEST ANSWER: The padded pocket inside will accept a laptop of about 16" x 12" or possibly larger when not fitted in the pocket. It would comfortably hold a 3" binder. A thinner binder would fit with say a textbook and a notebook all together. The side pockets are 2 sizes, one holds about a 20oz. water bottle. The other can hold a 1L seltzer bottle, but keep in mind the bag will not hold both water bottles, books, and laptop simultaneously. You could only use 1 of 2 bottle pocket if inside is stuffed as the pockets consume interior space. Also, lots of misc. pockets for snacks, pens, phones, etc. Definitely fits laptop and some binders or books. Usually I carry a laptop, tablet binder, journal, Pens and a couple files. I have trouble fitting a water bottle in the side - I use them for vineyard tools. I love this for running from work to meetings to errands. It's my daily bag. But if you're caring a lot of weight it wouldn't be the most supportive. I rarely have over 10-15 lbs in it. Also pen cases are useful, the interior pockets aren't great organizers. It's a lot easier to throw small bags of cosmetics, pens etc for the little stuff than searching the bottom of the bag. It is big enough for laptop and binder, but as someone who went throught nursing school I wouldn't recommend it. The straps aren't cushioned at all, so a heavy load would be uncomfortable. Also I don't think it's big enough for large textbooks. Also if the bag isn't full I can fit a 32 oz. Hydroflask bottle in the side pocket. It's really better as a casual bag, I took it as a carry on for a flight and loved it. Hope that helps! A MacBook Pro and a book fit well in the bag as far as length and width. I had my Hydro flask situated in the side pocket. The Hydro Flask is the 18 oz. Hope that helps you out. It carries my laptop and a few books. But notley also didnt think the strap situation out. If you wear it like babbackpack if falls the entire length of both straps. What is the size of the laptop pocket? Need to know if my Dell will fit into it. BEST ANSWER: The padded sleeve fits a computer no larger than 15” laptop. What are the dimensions of this bag? Trying to visual it's size when worn either way. Thanks! BEST ANSWER: The dimensions of the bag are 17" x 14.5" x 3.5." how does this become a crossbody purse? BEST ANSWER: This style is not designed to be used as a cross body purse. It can either be carried as a tote or as a backpack. You may like our Style 131221B, that is a cross body bag. The link for this item is below. Are Carhardt products made in the USA? BEST ANSWER: Some of our most popular styles are made in the USA, but we also have products made in other countries.